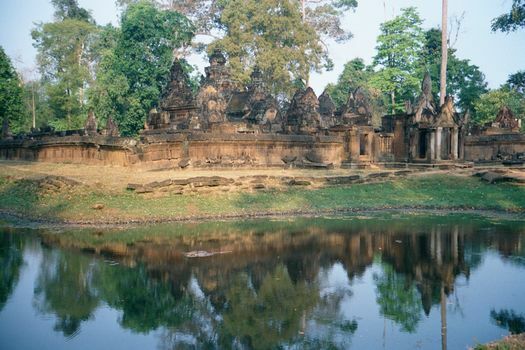 Fifteen miles north of the central cluster of monuments, but close to the Siem Reap River that flows past them, Banteay Srei is a small but profusely decorated temple built in the late 10th century by Yajnavaraha, the spiritual teacher of Jayavarman V. The name means "citadel of women," probably referring to the combination of massive walls and delicate decoration. 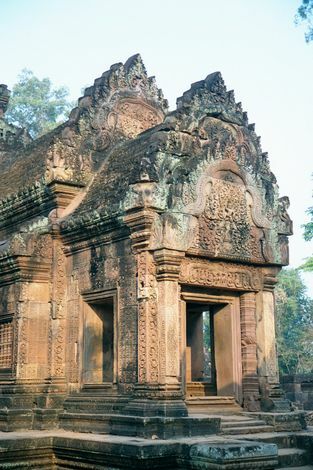 A moat surrounds this small temple, shown here from the southeast: the walls inside the moat are approximately 40 meters long. Inside, there was another wall, but it's gone. On the right here is the eastern gopura, approached over a causeway. A closer look at that two-tiered entrance. 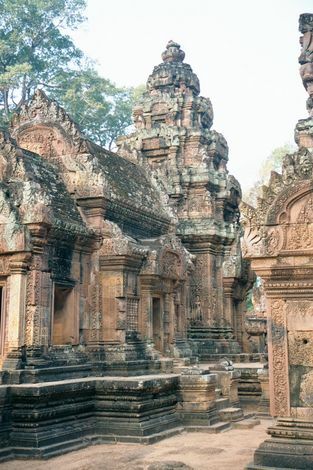 The carvings are well preserved, because the stone is an unusually hard pink sandstone. 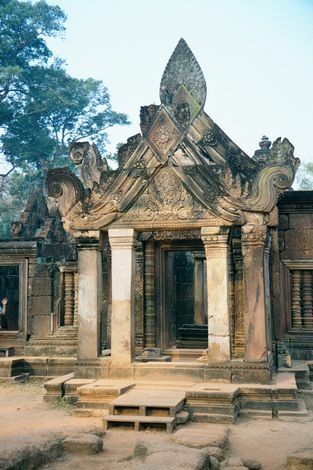 Inside the gate: the foot of the T-shaped sanctuary. The bar of the "T" consists of three shrines that almost touch one another. 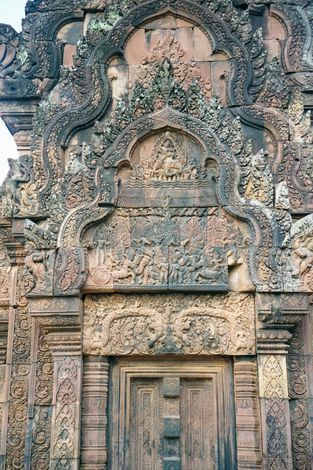 The central one, on the right here, honors Shiva; the one on the north (invisible here) honors Vishnu. The leg of the T lies to the right. 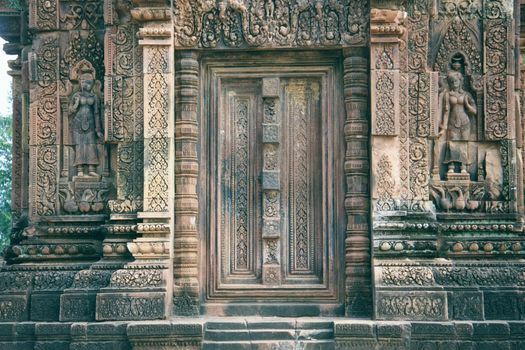 The blocked south door of the sanctuary, with goddesses. On the east side of the sanctuary are two freestanding libraries, each with elaborate pediments. 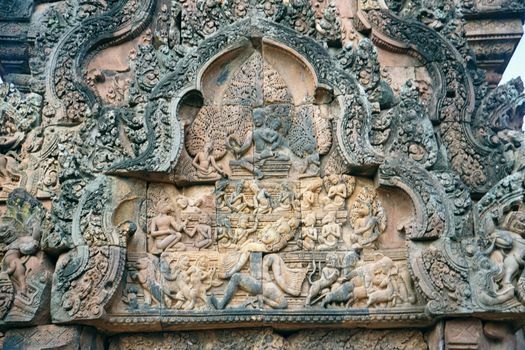 In this one (the east pediment of the north library), Indra rides a chariot pulled by an elephant and sends rain to put out a fire that was deliberately set in the Khandava forest by the god Agni, who was trying to kill the serpent whose heads rise in the center. Agni is helped from below by Krishna and his brother Balarama, who shoot arrows into the rain to deflect it. The east pediment of the south library shows the demon-king Ravana shaking Mount Kailash after being denied entrance to this home of Shiva. The much smaller figure is of Shiva's wife, Parvati. Retribution is swift: Shiva gets ready to pick up the mountain with one toe and bury Ravana. The mountain itself takes the stepped-pyramid shape of a temple-mountain.